Free, Printable Coloring pages of fossils from various geologic time periods. 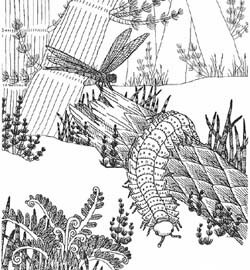 Here you will find Free Printable coloring pages of fossils, extinct animals, and scenes from various geologic time periods. These pages are the work of artist David Cobb. These prehistoric animals have been taken from our first series of children’s books on fossils and Geologic Eras. These files are free and printable coloring pages in PDF format. You will need Adobe Reader in order to view or print these files. If Adobe Reader is not already installed on your computer you may download it free here. (A new window will open so you can download without leaving this page).